The Antarctic Peninsula is one of the fastest warming spots on the planet, and it was thought that the rising air temperature was driving the melt of the glaciers along its fringes. But it is actually warm ocean waters that are eating away at the ice along part of its western side, a group of scientists reported Thursday in the journal Science. Icebergs that have newly calved from glacier fronts in Marguerite Bay on the west coast of the Antarctic Peninsula. 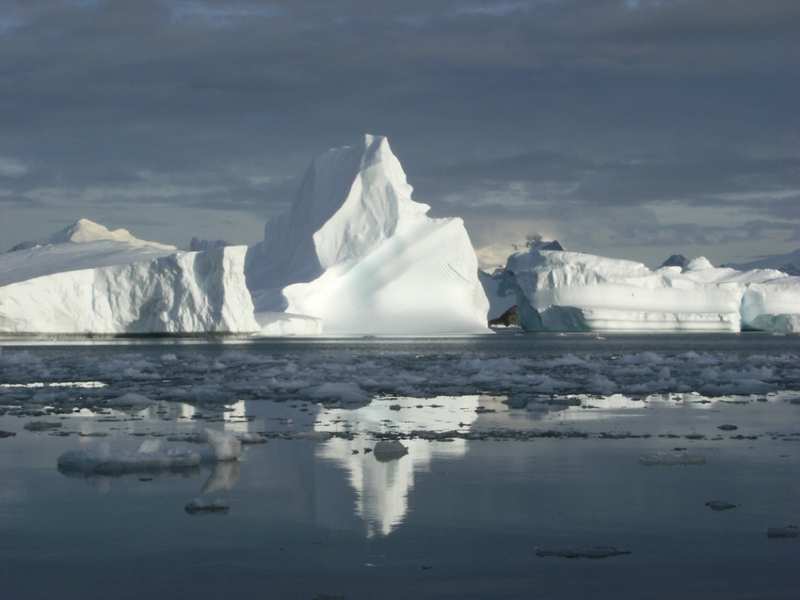 The study adds to a spate of research in the last few years that have pointed the finger at warm ocean currents as the key culprit in undercutting the glaciers that serve as doorstops to Antarctica’s massive ice sheets. As those glaciers wilt away, the land-bound ice behind them can flow faster to the sea, with the potential to significantly raise global sea levels. Coastal areas around the world will be swamped, putting millions of people and billions of dollars of infrastructure in peril. While the rest of the continent’s coastline features vast rivers of ice that flow to the sea, the west side of the Antarctic Peninsula is made up of “over 600 small glaciers of varying shapes and sizes,” Cook, a glaciologist at Durham University in England, said, few of which had been studied in any detail. The peninsula — an arm of land that stretches up from the rest of Antarctica toward the southern tip of South America — has warmed about 5°F (2.8°C) in the past 50 years. Unsurprisingly, the region has seen considerable ice melt, and that melt was blamed on the surging air temperatures driven by the broader warming of the planet's atmosphere. It was clear that there was a distinct pattern of melt from north to south, though. In the northwest, the region of the largest air temperature increase, the glaciers paradoxically seemed fairly stable, while in the cooler southwest there had been considerable retreat. Cook and her colleagues looked at ocean temperatures along the west coast of the peninsula and found a pattern of temperatures at mid-ocean depths that mirrored what was happening to the glaciers. “The more we studied this, the more it became apparent that this followed a striking similarity to the glacier retreat rates,” Cook said. At the southern end of the western side of the peninsula, warm Circumpolar Deep Water that has welled up meets the glaciers and wears away at their fronts. At the northern end of the peninsula, the glaciers terminate in colder waters that come from a different source, keeping the fronts of those glaciers much more stable. “This is a great study with convincing evidence that the northern and southern west coast of AP (Antarctic Peninsula) have very different oceanic regimes and the correspondence with the pattern of glacier retreat is undeniably strong,” Eric Rignot, a NASA glaciologist said in an email. The same Circumpolar Deep Water implicated in the new study is thought to be eroding glaciers elsewhere along the West Antarctic coast, including an adjacent area of the Bellingshausen Sea coast where a recent study suggested melt had been happening for much longer than previously thought. 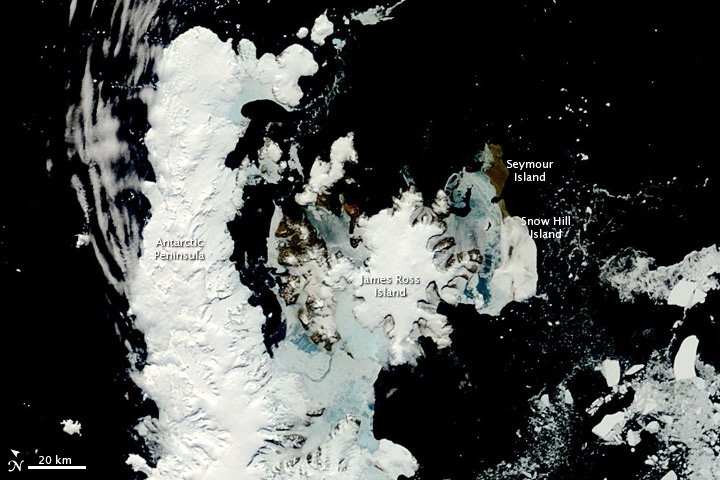 The Antarctic Peninsula as seen by a NASA satellite in November 2010. “This study underscores what many of us in the scientific community have been suggesting for some time, namely that ice losses from around Antarctica owe as much to warmer ocean temperatures reaching parts of Antarctica's coastline as to rises in air temperature,” Robert Bingham, a glaciologist at the University of Edinburgh, said in an email. Bingham, who led the Bellingshausen Sea study, was not part of the new research. While the glaciers along the Antarctic Peninsula are much smaller than those in the Bellingshausen Area, or the Amundsen Sea Embayment, where some of the fastest-slowing and retreating glaciers are found, their potential to contribute to sea level rise cannot be discounted. While they make up only 4 percent of Antarctica’s total ice sheet area, they have accounted for about 25 percent of its mass loss. “The AP ice sheet is one of the largest current contributors to sea level rise and as the glaciers here are highly sensitive to changes in the environment they are key indicators of how the ice will respond to future changes,” Cook said. The study’s findings lay bare the need for better understanding and monitoring of both Antarctica’s glaciers and the oceans lapping at them, Bingham and Rignot said.